Drag-flick exponent Sandeep Singh played the star role, knocking in five goals, to record his third hat-trick of the tournament, as India pummelled France 8-1 in the title clash of the Olympic Qualifying Men's Hockey Tournament at the Dhyan Chand National Stadium here tonight, to book a berth for the London Olympics 2012. India has at last broken the Major Dhyan Chand National Hockey Stadium jinx by winning the Olympic Qualifying Tournament defeating France 8-1 in the final. Never before India won a title at this historic stadium. 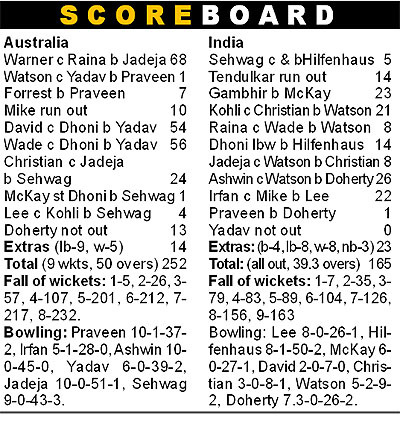 India were virtually knocked out of the cricket tri-series after a crushing 87-run defeat at the hands of Australia. India might be seething with anger on the controversial 'obstruction' incidents in the cricket tri-series match against Australia today but the home side opener Shane Watson suggested that the two umpires had taken correct decisions. After three days of action, the final trials to select the Indian squad for the upcoming Continental qualifying Championship that will be held from April 5 came to an end today. The trials witnessed power-packed performances and left everyone guessing as to who had an upper edge, especially in the weight categories of 52 kg and 56 kg where the battle is intense. The All India Inter University Boxing Championship started at Lovely Professional University (LPU), Jalandhar yesterday. LPU is hosting the championship fro men and women under the aegis of AIU (Association of Indian Universities) that will concludes on March 7th 2012. Under this, 101 Universities from every state and Union territories of India are participating under the sizzling slogan of “The Fighter-A Hero will Rise”. Canada edged past Poland 4-3 in a pulsating encounter to secure the bronze medal in the men's hockey Olympic Qualification tournament, here today. The third-fourth place classification match between Canada and Poland was a lively contest as both the teams came out with attacking hockey in a bid to outsmart each other. Drag-flick exponent Sandeep Singh played the star role, knocking in five goals, to record his third hat-trick of the tournament, as India pummelled France 8-1 in the title clash of the Olympic Qualifying Men's Hockey Tournament at the Dhyan Chand National Stadium here tonight, to book a berth for the London Olympics 2012. India had rode on Sandeep’s penalty corner conversions in all the previous matches, and he lived up to the image of a drag-flicker with a deadly touch, as he scored five goals, all off penalty corners, to take his total tally in the tournament to 16. He also got the man of the match award, but it was Sardar Singh, captain for the day, and who played stellar hockey throughout, who walked away with the man of the tournament award. Hockey India and Lalit Hotel announced Rs 1 lakh each to the players for their brilliant display. In fact, India converted six of their seven penalty corners today, as V.R.Raghunath too made no mistake with the seventh when Sandeep was benched, and this win was one better than their 6-2 triumph against France in the league stage. After playing scrappy hockey for the first 15 minutes when Sandeep’s first penalty corner scoop was padded away by French keeper Mathias Dierckens in the third minute, and many of their moves fizzled out outside and inside the dee, India took the lead in the 16th mintue. Manpreet Singh sent a perfect pass from the top of the semi-circle, and Birendra Lakra trapped it before quickly whacking it high into the goal (1-0). Three minutes later, Sandeep Singh started his goal-hunt with a perfect scoop off the second penalty corner to put India 2-0 ahead. But France created some flutter with a goal against the run of the play, which stunned the hosts. Sebastian Jean-Jean dashed in and put the ball in charge of Simon Martin Brisac, who shot in on the run, to narrow the lead (1-2). But Sandeep did a perfect job with the third penalty corner as well, to widen India’s lead to 3-1 at half time. Three minutes into the second half, Sandeep once again showed his drag-flicker skills to score off the fourth penalty corner, and then a Danish Mujtaba-Tushar Khandekar-S.V.Sunil passing bout ended in the last-named finding the mark for the fifth goal. Sandeep then converted the fifth and sixth penalty corners to make it 7-1 while Raghunath slotted home off the seventh PC, when Sandeep was benched, to complete the miserable run of France. Not that the visitors were mere doormats for the hosts to run over, as they had their share of chances too, when they forced four penalty corners in a row midway through the second session - overall they had six - but the Indian defence, particularly custodian P.R. Sreejesh, played true to baulk the French attempts. Once when Sreejesh was beaten, Ignace Tirkey saved from the goal-line to deny the visitors another goal. India had missed the Olympic bus to Beijing 2008, for the first time-ever in the history of Indian hockey, but today, the hosts redeemed their lost prestige by getting back into the Olympic fold, with an authoritative victory, which sent the packed stands into a frenzy. But they had not begun the match very assuredly. Spraying mis-passes galore in the first few minutes and were even unable to properly trap the ball. With a near-full house rooting for them the Indian team were under palpable tension, but once Sandeep Singh got into his scoring act, there was no looking back for the hosts, barring that lone goal by France. It was India’s second win in three matches the two countries have played in the Olympic Qualifying Tournaments since 1991. It was in 1982 Asian Games final that India suffered a humiliating defeat at the hands of Pakistan at this historic venue. And in 2010 India suffered yet another big defeat, this time at the hands of Australia in the final of the Commonwealth Games hockey competition. It may be coincidence that big defeats in the finals came in the presence of Indian Prime Ministers — Indira Gandhi in 1982 and Manmohan Singh in 2010. And today it was Sports Minister Ajay Maken who inaugurated the final. The only time India won a hockey gold in New Delhi was in 1982 Asian Games Hockey competition for women when India was on the victory podium at Shivaji Stadium, another venue of competitions. It is for the fifth time that India was playing in an Olympic qualifier beginning with Auckland in 1991 where India lost to the Soviet Union in the final. Only time India failed to make it to Olympics was in 2008 when it lost to Great Britain in the final of Olympic Qualifier Tournament in Chile. India were virtually knocked out of the cricket tri-series after a crushing 87-run defeat at the hands of Australia, who qualified for the final after today’s 10th match of the tournament, which also features Sri Lanka. Only a miracle of Australia beating Sri Lanka in the next tie and then India also beating Sri Lanka by a big margin with a bonus point will see India in the final. India sit at the bottom of the points table with 10 points, Australia are at the top with 19 points while Sri Lanka have 15 points. In case both Sri Lanka and India end tied with 15 points, the Net Run Rate will come into play. The Indians did reasonably well in the death overs to restrict the hosts to 252 for nine but could never really recover from the early jolts to fold up for a paltry 165 in 39.3 overs to suffer their third defeat on the trot in what turned out to be a lop-sided contest marked by controversial ‘obstruction’ incidents. Australia rode on useful batting contributions from David Warner (68), Matthew Wade (56) and David Hussey (54) and some disciplined bowling on a sporting SCG track. It was again the spineless batting display that cost India dearly in a match which they desperately needed to win to keep their hopes alive for a berth in the finals. As many as six Australian bowlers grabbed wickets with Shane Watson marking his return to international cricket with 2 for 9 from five overs. The by now-familiar inability of the top order to strike was in evidence as was the fact that middle-order has now become adept at wasting good starts. Virender Sehwag (5), utterly miserable on this tour, again came a cropper, lasting 11 balls and driving a return catch to Ben Hilfenhaus who took a stunning catch off his bootlaces in his follow through. Sachin Tendulkar (14) was run-out and went away gesticulating angrily, believing bowler Brett Lee had purposely blocked his path. Gautam Gambhir had dabbed a ball on the off-side and Lee crossed the pitch in a bid to prevent a single. But even as fielder David Warner picked up the ball and took a shy at the stumps, Lee stood in a manner, hands on his knees with his back to the non-striker, that Tendulkar had to go round him and thus lost the crucial second of making his ground. It was the second controversial moment of the day, the first being the 'obstructing the field' appeal against David Hussey which wasn't upheld by the umpires. Hussey had thrust out his hands and prevented Suresh Raina's throw from reaching the stumps but umpires reckoned the batsmen had done so to prevent a physical injury and he didn't intend to prevent a run-out. The action unfolded after the final delivery of the seventh over bowled by Lee in India's run at the venue of the infamous '2008 monkeygate scandal'. Gautam Gambhir called for a single to which Tendulkar responded only to be run out by David Warner. Lee was seen standing in Tendulkar's way after running across the pitch while the Indian was sprinting towards the crease. Tendulkar threw his arms up in frustration when the ball hit the stumps, making it clear that he wasn't happy with Lee blocking his way but umpires Simon Taufel (at square leg) and Billy Bowden ruled against the batsman after some deliberation. Dhoni at the post-match press conference was unsparing on Lee, saying the Australian pacer had no business to stand on way of Tendulkar. Another controversial incident in the match was the turning down of 'obstructing the field' appeal against David Hussey and Dhoni maintained that umpire Billy Bowden erred in not declaring the Australian batsman out after the Indians appealed. "I think David was really lucky not being given out. He (David) thought he was protecting his face but his hand was too far ahead. I don't know why he was not given out. 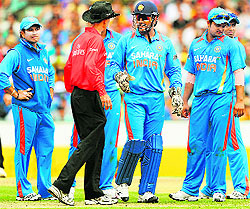 We were at receiving end of both umpires," said Dhoni. "In soccer if your hand was popping out, you would be given a penalty irrespective of what has happened. That's plain and simple. If you look at that incident, David was out," he added. The incident happened in the 24th over of the Australian innings when they were at a precarious 119 for four with wicketkeeper-batsman Matthew Wade taking off for a single off R Ashwin's final delivery. Non-striker David Hussey answered his partner's call but as he was completing the run, the Australian put his right hand out to stop the ball from hitting him. Dhoni appealed for an obstructing the field dismissal which is allowed under the ICC rules. The two controversial decisions went against the Indians as the umpires turned down 'obstructing the field' appeal against David Hussey and against Brett Lee on the run-out of Sachin Tendulkar. "Taufel and Bowden are the two best umpires in the world. I have total trust in them. They would have given a lot of thought into what goes into that decision. To be involved in running Sachin out, it would never be ideal to the great man," said Watson who stood in for Michael Clarke, out of the match due to a stiff back. "I thought he was disappointed with Gambhir for taking that one as probably there was no run in it. He was not happy and kept looking back at Gambhir all the way back," he said at the post-match press-conference after Australia thrashed India by 87 runs to qualify for the tri-series final. "I didn't have time to speak to Hussey. I would do it tonight to know what he thinks about the decision. Hussey wouldn't do anything wrong, he plays hard but fair," he added. Watson said that he was surprised by the consistent failure of the much-touted Indian batting line-up throughout the tour of Australia. "Just to see a few of their guys got out tonight ... the likes of Kohli and Dhonis, it's just not about scoring but how consistently they do it. Sachin and Sehwag are big guns to miss out consistently. You never really see with this Indian team," Watson said. On the concluding day of the trials, Suranjoy Singh and Sunil exchanged continuous punches in all three rounds to reserve a berth in 52 kg. Beaming with energy, both boxers displayed amazing skills and while landing one of the punches, Suranjoy’s glove came off. In the 56 kg weight category, Shiva Thapa and CL Yadav rubbed shoulders. Shiva Thapa landed some spectacular straight right punches that were highly applauded by the audience. Olympian Dinesh Kumar also fought a decisive bout with Sumit Sangwan. He seemed to be in control of the situation throughout the bout. Meanwhile, on Day 2, Vijender and Kuldeep Singh locked horns in 75 kg weight. Though Kuldeep gave him a really tough fight, Vijender seemed relaxed and confident throughout. Taking to The Tribune about the performances, Brig PK Muralidharan Raja, Secretary General of the Indian Boxing Federation, said these trials had witnessed one of the best bouts of the season and therefore it was an equally tough task for the selection committee. “We will announce the list of selected players tomorrow or day after but the selection will solely be based on performances,” he added. Throwing light on the future plans for the core group, he informed that the Federation has chalked out proper training schedule for these players for the month of March. “While few of them will be going to Kazakhstan for couple of days, others will be going to Czech Republic. We are hopeful that at least 2 to 3 players will be able to qualify for the London Games. Once the qualifiers are over, we will train the selected lot in the European circuit because in London also, they will face a lot of European opponents,” added Brig Muralidharan Raja. Prof. A.D.N. Bajpai, VC, HPU, Shimla and Secretary General, AIU, inaugurated the mammoth National level event by hoisting the Sports Flag at the campus. He was accompanied by the Chancellor of LPU Mr. Ashok MIttal, Pro Chancellor Ms. Rashmi Mittal, Vice-Chancellor Dr. Rameshwar Kanwar & Director General Er. HR Singla.